I have always been interested in the war. My father has been tragically affected by the war, loosing the heart of his hometown Rotterdam in the bombing of May 1940, loosing his wife in November 1942 due to war time lack of medicines as a tributary cause, and loosing much of his mental stability after being captured in November 1944 and put to force labour in Germany and later abused in a concentration camp, barely surviving the war. He always had a keen interest in everything WWII though, probably reliving much of his memories and trying to get to grips with the why's and how's, without ever hardly speaking a word to us about it. His interest affected me as well and I remember buying a book titled "Deutsche Kriegslokomotiven" by Gottwaldt as early as 1975. Having grown up in the Fleischmann-and-Märklin bubble I only came to realise in later years that not only Germany had produced locomotives specifically for the war effort. Even UP's Big Boy could be seen in this light, although it maybe does follow the strict definitions (if they exist). 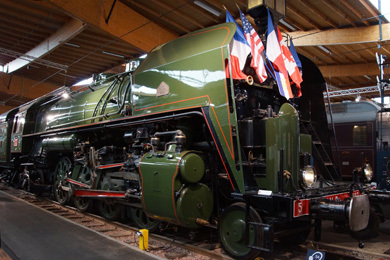 But locos like the French Mikados, the S160s and not least the British Austerities have my keen interest. Speaking of which, what would be a good definition for a war locomotive? I have never read one, so I will give it a go. Every definition is a reduction of reality into schemes and therefore by its very nature imperfect. So I ask everyone reading this to challenge the definition and improve it. specifically designed and built for the purpose and the duration of the war. 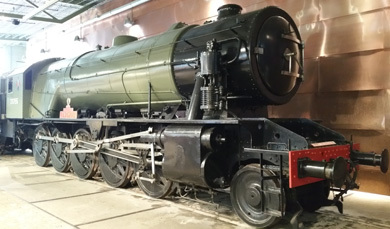 a locomotive so a rail bound motive power vehicle used to propel trains, but not necessarily a steam locomotive. Internal combustion or electric traction could also be possible (although I have no knowledge of the existence of any class of the latter). class we are not talking about single locomotives or even an extra batch of locomotives of an existing ordered for the war effort. Only if (almost) the entire class is designed and built for the war effort and the class is substantially able to sustain the war effort then its members may be called war locomotives. and operated in theatres of war. if needed accepting a reduction in the lifetime expectancy of the locomotives. This can be a gradual process, the changes from peacetime production to wartime austerity usually take place in several generations and with a growing insight of what can be dispensed of and what proves to be an absolute necessity. But it is the intent with which the design changes take place which determine the class to be a war locomotive and not merely the end result. 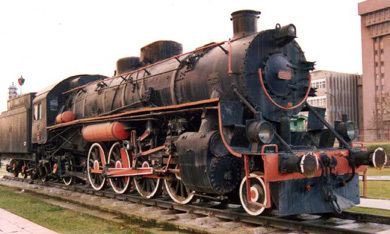 So I am inclined to call the 52ÜK (Übergangkriegslokomotive = transitional war locomotive) a true war locomotive as the intent of the design changes was clearly to reduce the effort to produce and maintain the locomotive with the war in mind. built the locomotive is built during or shortly before the war as a integral part of the logistical military needs of the war. duration the expected duration of the war is reflected in the design of the locomotive. war although it is not explicitly stated anywhere I so far have met the theme of "war locomotive" only in the context of both World Wars, so I am inclined to limit the definition to those two conflicts. I have no knowledge of any examples of true war locomotives outside these two conflicts. What is the consequence of this definition? It can best be demonstrated with a few examples. The BR 52 and BR 42 classes are clearly a war locomotives. They were built for the duration of war only, the class BR52 was supposed to last only for five years. After the war they were quickly dispensed with or thoroughly rebuilt to make it viable engines. The BR 58 (Pr. G12) was not a war locomotive, because its design followed peacetime practises. It did see action in the war but it numbers were too low to have a substantial influence on the war and building the locomotive continued unchanged until well after WW1. I have hesitations to mention the SR Q1 a war locomotive. It was austere but only due to the lack of sufficient building materials, its austerity was not with the actual war effort in mind. The class was not numerous enough or ever intended to be so to really have an effect on the war. It also never saw a war theatre. Maybe I will designate it as a War Baby: a consequence of the war rather then part of it. Big Boy? Same story as the Q1. However, although low in numbers (25) the class may very well have had a substantial impact of the logistical needs in the last two war years. 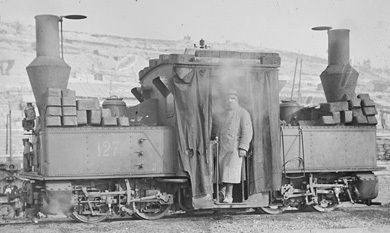 The diversity of the parties in the conflict and their respective views on what was necessary for the front created a spree of locomotive classes in the battle field. I cannot even begin to think of describing them all so the list below is just a sample, although I have tried to picture the most dominant classes. Built in large numbers for the trench war in the western front this locomotive is probably the most numerous articulated locomotive class in the world. 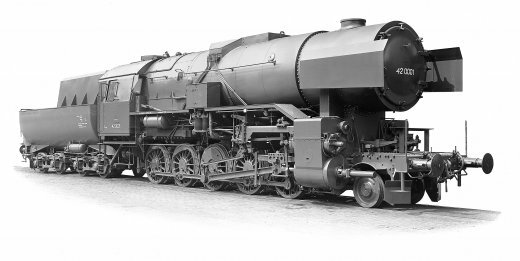 Its was a Klien-Lindner (semi-)articulated locomotive. 93 examples survive in 11 countries. Built to Fairlie principles this type as a single class outnumbered all other Fairlies in the world together! 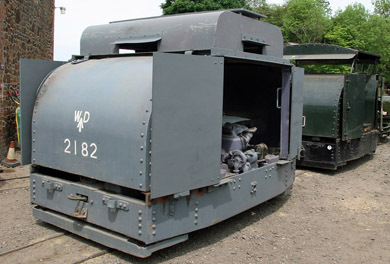 The idea was that if one power unit was disabled the other could at least bring the loco home. Probably the most diminutive locomotive of all the classes listed here, it did great service transporting people and goods directly behind the front. Being a petrol engine it drew far less enemy attention (and therefore equally less enemy fire) than a steam locomotive. Baldwin supplied 195 of these locos for the US troops from 1917, another 110 were supplied by other US builders. 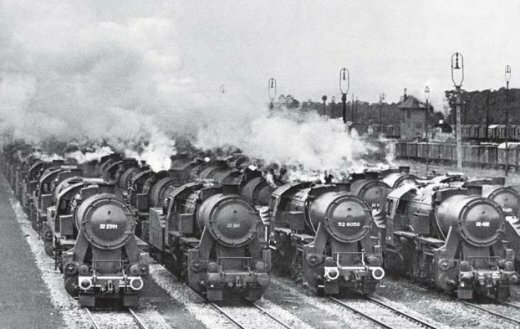 Although the Second World War also produced a huge variety of locomotive types the overall picture is more uniform. 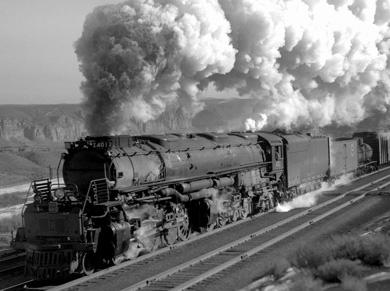 Efficiency and ease of maintenance dictated a far more homogenous motive power policy. What the Liberty ship was for the US was the BR 52 for Germany: simply build the locos faster than they could be destroyed. Derived from the peacetime BR50. Developed for light and badly laid track with a life expectancy of just five years. After the war production continued until stocks had been used up. 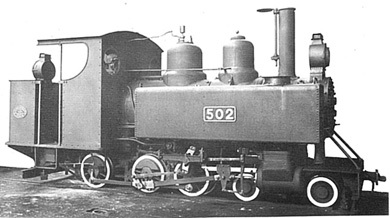 Heavier locomotive based on the experience gained with the BR 52. Production was slow to start and so late in the war it was too little too late. Much of the production had been left unassembled at the cessation of hostilities. Less known is that the German army had a program to develop military railways behind the front. As the subject is extensive I will suffice to picture one of the surviving examples. For more information please refer to the book "Heeresfeldbahnen" by A.B. Gottwaldt, 1986, ISBN 3-613-01080-1, a most interesting read. 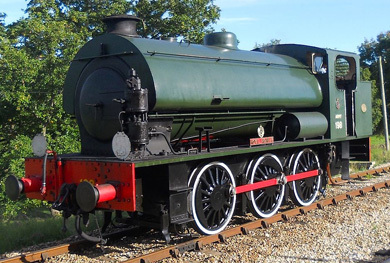 Derived from LMS class 8F Riddles developed a simple, sturdy locomotive to support the moving front once the invasion of Europe would happen. Awaiting the invasion they served the domestic railways in the logistical effort of the war. 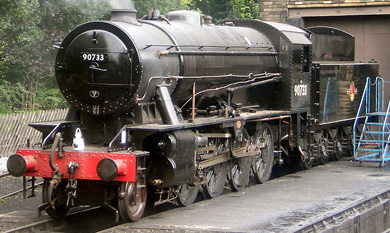 90733 (ex NS 4464) at Haworth at the KWVR, 2007. Public domain. 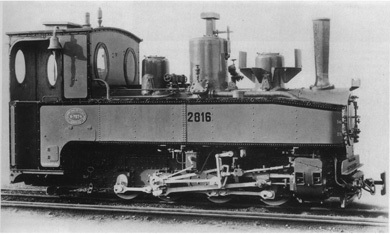 Developed along the same principles as the 2-8-0 this locomotive was intended for lighter railways. Contrary to general belief this locomotive was not stronger, was just lighter per axle. As war babies I envisage all those classes that came into existence because the war effort created a huge demand for motive power or just the opposite: the war itself created a huge lack of power due to the destruction of the railway system. The designs however followed the more or less regular peacetime design practises and were not specifically tuned to austerity, ease of maintenance in the battle field, a limited lifetime or that sort of things. Although its design was clearly necessitated by the increased traffic incurred by the war the Big Boy may have come into existence anyway. The design was conceived during the war. 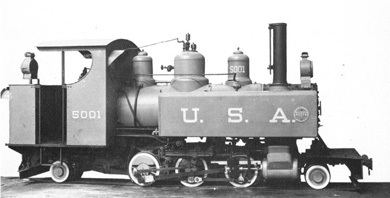 Built in the USA the design was adapted to the French loading gauge. The loco were deployed only after the war to help the French railways to overcome the utter devastation inflicted on them. As such the class never saw true war action and only served civilian purposes.